ALBEMARLE COUNTY, Va. (WVIR) - Albemarle County Sheriff J.E. "Chip" Harding is asking the governor to release Jens Soering, a former University of Virginia exchange student convicted of murder. Soering is serving a life sentence for the 1985 murders of Derek and Nancy Haysom in Bedford County, the parents of his then-girlfriend Elizabeth. He admitted to the crimes, but has since claimed his confession was false. "This is my fault. 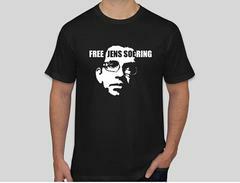 I should have told the truth," said Soering during a 2011 interview with NBC29. He now believes Elizabeth took part in the murder of her parents with two other men. Attorney Steven Rosenfield, who now represents Soering, said his client, "misidentified where the bodies were murdered, and there is really no physical evidence tying him to the crime scene." Sheriff Harding believes, based on his own investigation, that the German national should be pardoned. The sheriff went on to write, "almost every piece of evidence raised by the prosecution is subject to inaccuracies, unreliabilities, and scientific contradictions. The jury was misled in many places, and the lead defense lawyer was mentally ill and later disbarred. The result was that the defense counsel was mediocre at best." Harding also pointed out that two investigators in the Soering case - Chuck Reid and Dave Watson - now conclude there is enough reasonable doubt to not reach a murder conviction. Reid, a former instigator with Bedford County Sheriff's Office, went back over the DNA evidence and the original FBI assessment of the crime scene. Reid told NBC29 back in October 2016 that he could not be sure Soering committed the crime. "I started hearing the testimony from Elizabeth, from Jens, and the evidence that was presented and that's when I started getting my doubts. I said, ‘Something not adding up here,’” Reid said. In August 2016, attorneys for Soering revealed DNA findings which they say prove their client's innocence. They say a comparison between the 1985 serology report and a more recent 2009 DNA review shows Soering's blood is nowhere to be found. "Based on the evidence I reviewed and the recent DNA findings, I feel that [Elizabeth] Haysom was at her parents’ home at the time of the murders and was assisted by two men. These two men accidentally left their blood behind at the murder scene. The DNA is representative of each of these men. They are there, I cannot see their faces, but they are present. 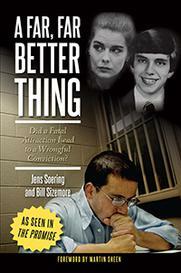 I do not see the face of Jens Soering because there is nothing from him in the crime scene." Rosenfield and Soering have asked for a pardon from Governor McAuliffe. Then-Governor Tim Kaine had approved Soering be allowed to serve the reminder of his sentence in Germany, but that was ultimately rejected by Bob McDonnell when he was elected. Soering went before a parole board in December 2016, but has yet to complete its review. Albemarle Sheriff J.E. “Chip” Harding has written a 19-page letter to Governor Terry McAuliffe in support of the release of Jens Soering. The letter will be included in the 2nd Supplement to the Pardon Petition that will be forwarded to the Governor by Soering’s attorney Steve Rosenfield. Three months ago Rosenfield, who has worked on behalf of Soering pro bono for the past 6 years, had asked Sheriff Harding if he would review the Soering investigation and trial for the 1985 murders of Bedford County residents Derek and Nancy Haysom. Harding has given over 200 hours pro bono so far in his investigation. It is believed that this is the first time in Virginia’s history that an active Sheriff has written such a letter of support to a pardon request. Harding stated in his letter that he began his examination with knowledge of the case gained over the years from the news. He assumed Soering was probably guilty and he was in agreement with Governor McDonnell’s move to block Soering from being released to Germany. He has now reached a conclusion that Soering could not be convicted today on the evidence that has since surfaced or was improperly submitted or omitted from the jury. He further states the evidence, some of which was confirmed this week, appears to support a case for his innocence. Harding’s letter follows letters of support written in recent years by two retired investigators that have also reviewed Soering’s case. Former Bedford Sheriff Investigator Chuck Reid, who was one of the lead investigators on the Haysom murders in 1985 reached the same conclusion as Harding. Former Prince William County Police Department, Master Detective and first president of the “Virginia Homicide Association” Dave Watson, worked on the case for a year as a hired private investigator, wrote a letter in 2012 stating that there was not enough evidence to convict beyond a reasonable doubt. Sheriff Harding’s letter is attached to this release.